Although we may get cold in March, the meteorological winter is almost over and the models show little signs of the deeper cold we chase. 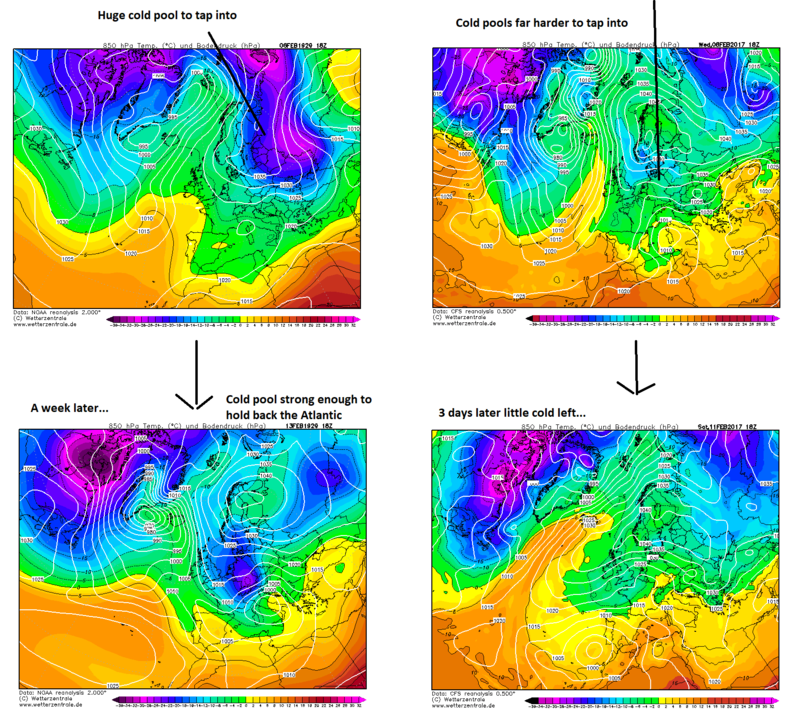 So I thought I’d discuss the winter which is passing by and speculate as to the main drivers of its synoptics. In truth the weather in November was actually pretty interesting, we had a very sluggish and amplified weather pattern… its just the UK wasn’t in the right place so it was mild here. We then had the potential for a serious cold spell with a large Greenland block as this swingometer from November showed. The Greenland high however wasn’t strong enough and milder air eventually won out. I believe that weather patterns can be like a see-saw and had we succeeded here, the chances of a cold December would have greatly increased but it wasn't to be. Aside from a brief cold snap mid month, December was awful and very mild over many areas. Although we had an SSW late on in the month the first half of winter was very poor. I wasn’t too concerned at this point however as I was going for a backloaded winter (which as I mentioned turned out to be wrong). Aside from the brief cold and snowy spell in late January the remainder of winter so far has been a write-off to be brutally honest. These periods saw some fantastic output only to be toned down to nothing closer to the time. These I believe hold some significance. 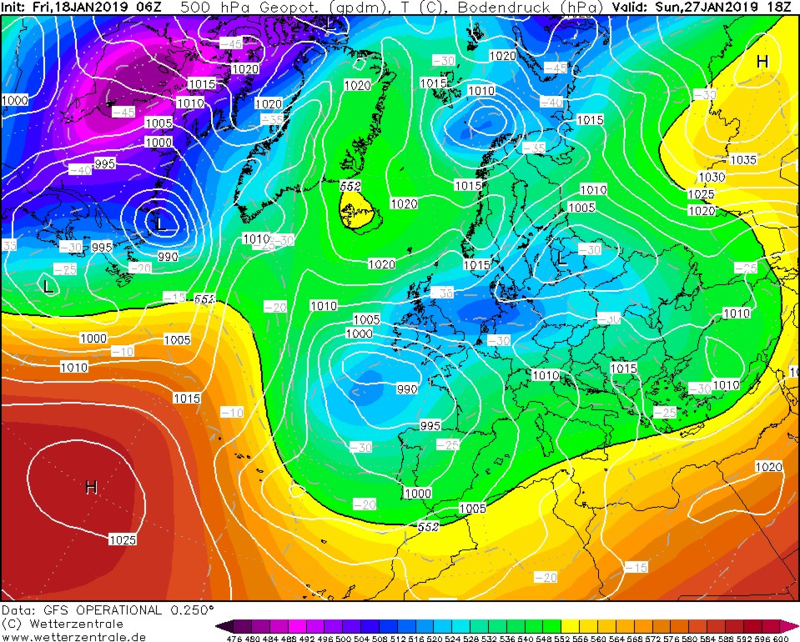 As mentioned I think a northern block would have increased the chances of a cold December. Think of 2010 and to a lesser extent 1995 (which saw a very blocked November but mild at times). If the vortex is displaced it can take a long time to re-organise itself and the synoptics during later November were a golden opportunity to split it, but it didn’t materialise. 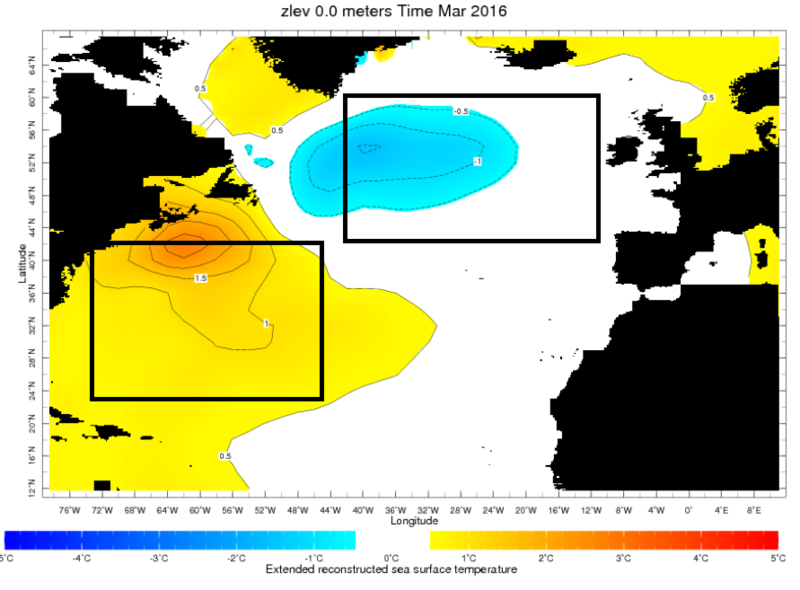 SST patterns over the NW North Atlantic during the second half of January show some correlation with those of the following February and March. Therefore if later January is blocked then the following February and March are more likely to be too as mild SSTs to our west would have persisted. However as we all know, the chances of an epic cold spell vanished at this time. Some really cold uppers with charts such as those forecast below were touted but the models flipped at the last minute as the swingometer painfully shows. The SSW event in late December to early January was really strong but the impact compared to February 2018 couldn’t be any more different. One of the problems was that the lobes of the PV fell into the wrong places. I noticed a lot of posts in the cold hunt thread were really hyping up the split vortex… without considering how the locations of the PV could impact things…. Split PV forecast example but this really wouldn't work for us would it? Unfortunately all the cold air spilled into the North Atlantic… which brings us to point number 3. You may have heard of this as it was in the news quite a bit a few years ago. It’s clearly evident when looking at global temperature trends over the last 100 years and may be related to climate change. When looking at individual winters…. Things get even more interesting. I’ve posted the SST anomalies for March following milder winters and you can see that cold anomalies to the south/east of Greenland are a common feature. What about cold winters? I think these are pretty clear. So are we completely overlooking ocean processes and given the pattern of increasing temperatures could we also blame climate change? 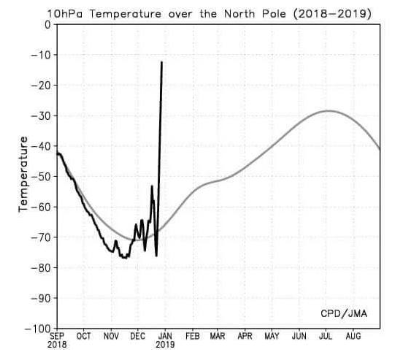 Either way the anomaly pattern below shows how 2018/19 fell into the trap of recent mild winters…. The Atlantic cold blob is driven by a polar vortex over Greenland that spills cold air into the North Atlantic and fire up deep Atlantic lows but also by changes in ocean circulation which in the longer run may be influenced by increased freshwater from melting ice. 4) Climate change? Ah yes the elephant in the room. I may have mentioned it in the model output thread a while back but I believe climate change is like a loaded dice. Imagine a six being the mildest and a 1 being the coldest. In a warming climate we can expect it to be easier to tap into warm pools and harder to tap into cold. These two sets of charts sum up that point very well. Often for a prolonged cold spell we need a deep cold pool to our east to hold back the Atlantic or prevent tapping into mild air. The lack of deep cold to our east meant there wasn't much of a fight to begin with. So does this mean that we will never never never see cold again? No… not at all here is how I think things will pan out in the future. 1) Summer/ Autumn Arctic sea ice will carry on decreasing in the long run – This will decrease the temperature gradient from high to mid-latitudes and will mean patterns will become stuck for longer. I believe the NAO will be more volatile with more often than not highly +NAO winters but periods of exceptional –NAO winters will also emerge to rival 2010. Neutral NAO winters will become less common. 2) There are some suggestions that some aspect of solar activity may have an impact on ocean circulation and this may finally help get rid of the annoying cold blob if it does... but there are other factors at play too. Perhaps there is a lag and we aren’t seeing the response to low solar activity yet. 3) A switch to a negative PDO…. 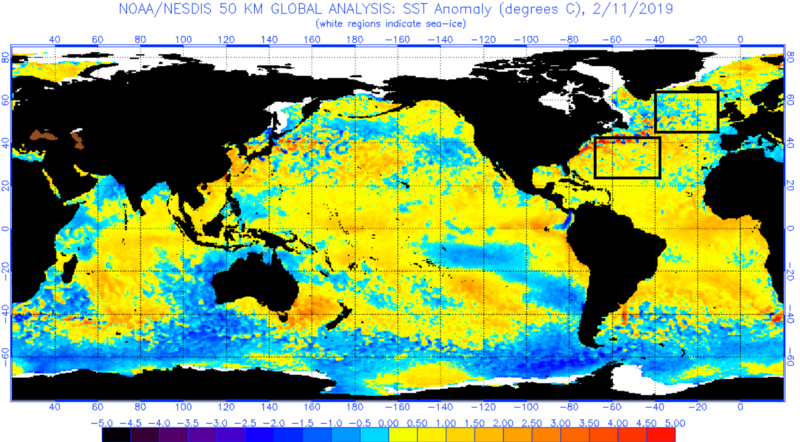 The cold blob in the Atlantic is also connected to some extent with the PDO too. It has often been positive in recent years whilst at the start of the decade it was strongly negative. So things may change for the better although I do believe because of climate change we will require better synoptics to tap into deep cold each year. Severe cold spells will still be a feature however and if the AMOC slows then we may see more in the way of 2010 like synoptics. All the additional heat may put the climate system under more stress and we could see a change in state (imagine pulling an elastic band, also read up on Lenton et al 2008 about climate tipping points). Is the NAO showing this increased stress with the volatility seen during the 2010s. Could the elastic band be about to snap? For next winter I suggest the following things to keep an eye on. 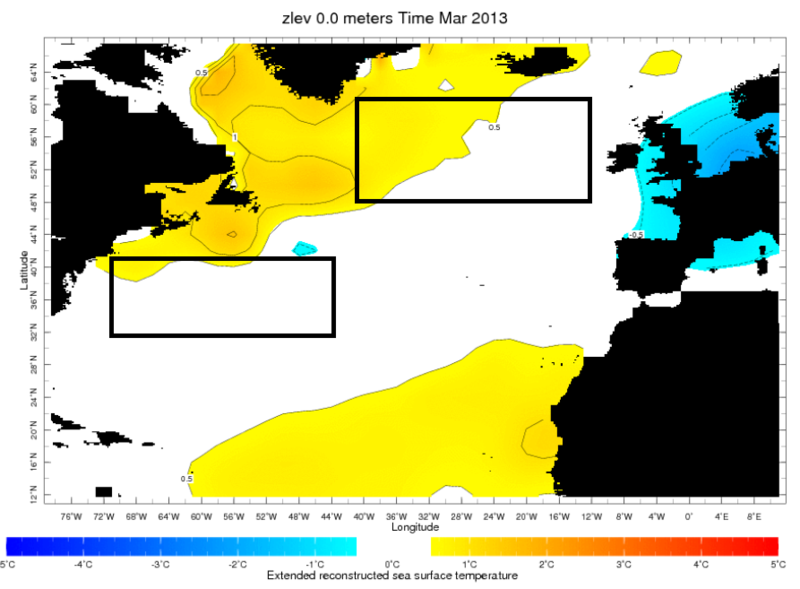 1) Keep an eye on SSTs around the NW North Atlantic and to our west. 2) When there is a future SSW event where are the lobes of the PV falling? 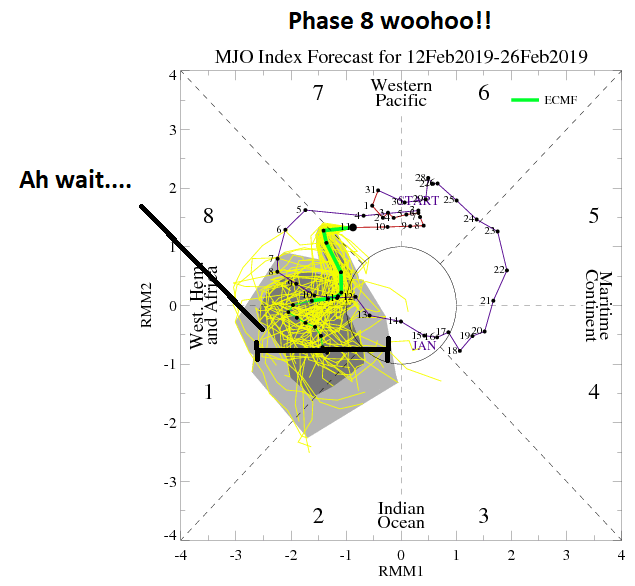 3) When viewing the MJO charts, how wide are the uncertainty bounds? For example on the below chart the spread is huge… so whilst the average indicates strong phase 8, it could end up anywhere….. This is the thread one dreads seeing towards the end of winter! Great work though and I will read in detail with much interest later! Well written and assessed. I know history shows us that not every SSW results in blocking setting up favourably to bring a notable cold spell to the UK, and the failed easterly of late January this year was one of the biggest let downs all winter. After the SSW this year we just got a watered down version of what could have been a far more severe cold spell. That said it is now disappointing that this February now looks very likely of falling into the trap of a very mild month and judging by the model output its overall CET could well end up in the very mild levels (6*C+) of 2011, 2014 and 2017, which would make this yet another notably mild February, and we have already had three notably mild Februarys this decade so far. No chance, although I think you would be forgiven if an BFTE now appears! A very detailed analysis as to what has gone wrong this winter. We have had a few pear shaped Februaries this last 10 years. 2009 had a very cold/snowy start and looked to be a very cold month overall. However, it became very mild during the second half of the month and finished slightly above the 1961-90 average. 2012 was similar with forecasts going for a much colder than average month and whilst the first half of the month was largely cold, especially for the south east, the core of the cold headed south across France. Like 2009, the second half of the month was very mild indeed. There have been similarities with 2019, although only the opening days were cold and wintry. However, like in 2009 and 2012, the forecast for a cold month is a bust. Winter hasnt been stormy though; i cant remember many days/weeks of continuous systems battering us OR do you see this happening in March? I've seen a lot of references to "mild" this Winter but it hasnt been that mild imho; not cold, for sure but not overly mild. Indeed, this winter hasn't been that stormy but a lot of the lows spawned from the deep Canadian cold have remained stuck to our west rather then the usual zipping from west to east. That can explain the lack of storminess in spite of the mild airmasses. The cold forecast to pour out of NE Canada next week is also forecast to fire up some deep lows on some ens but these are remaining out to our west. Winter 2013/14 in contrast saw the lows crossing right over us. The winter has seen some variations with January being close to average... however I think December was the second mildest of the last 30 years and it wouldn't surprise me if February also fell into the very mild category. Yes very true. Februarys 2009 and 2012 both started with very cold first halves and each looked to be well below average months overall - but both went belly up in the middle of the month and each had very mild second halves and each of them finished with a CET that in the end was close to the average. Although not following this same pattern a similar thing could be said about January 2013 - now this month had a significant cold spell with the 16 day period from the 10th to the 25th having a CET of -0.4*C. It was another unfortunate aspect of this month, that contained a 16 day spell of a sub zero CET, yet the month's overall CET didn't end up that particularly cold in the end; overall 3.5, which is not that much colder than average. Well written piece Quicksilver, lessons to be learnt for future winter forecasting, because despite how encouraging some signs, such as the SSW, and a few cycles through favourable 'colder' phases of the MJO, it appears there are other background drivers overriding these and muting their effects on upper patterns. 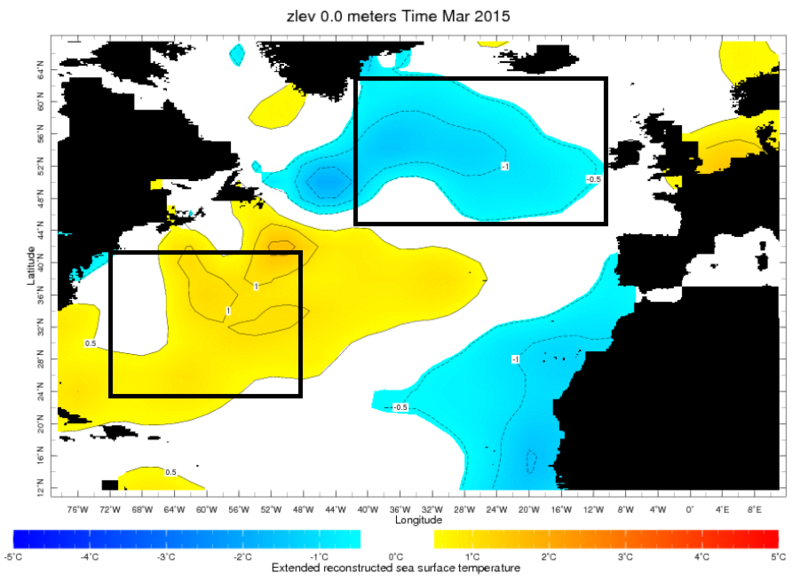 Must admit I and others have probably overlooked the effects of the Atlantic SSTs and the tripole along with the PDO. My own take in a blog for Netweather below on how I thought it may have gone wrong this winter, a lot of it because the SSW displacement of the split vortices being unfavourable and also of the Pacific state driving upper patterns unfavourably, notably the +ve SOI which has lent to a more Nina-esque patterns through much of the winter, despite weak Nino / neutral ENSO, not to mention the wQBO going into this winter - which is often linked to stronger Atlantic jet / +NAO. Yes I havn't really mentioned the QBO but I do believe that this is a factor also! How can we get rid of the atlantic cold blob in time for next winter.. it has been a feature of many winters recently. Mid atlantic highs would do the trick I think. We've been unfortunate this winter - its been a very quiet one atlantic wise, its just been the ridges have set up in the wrong place- shift everything 500-1000 miles west and we would have benefited from some much colder weather at least - lots of frost and ice days - not necessarily major snow, but a cold blocked one instead of a mild blocked one in the main. Watch everything change come Spring in favour of cold.. I think the PDO has been a major thorn in our side over recent times. The set up Pacific side has been just so wrong for us the majority of the time- with N America often seeing deep cold outbreaks. 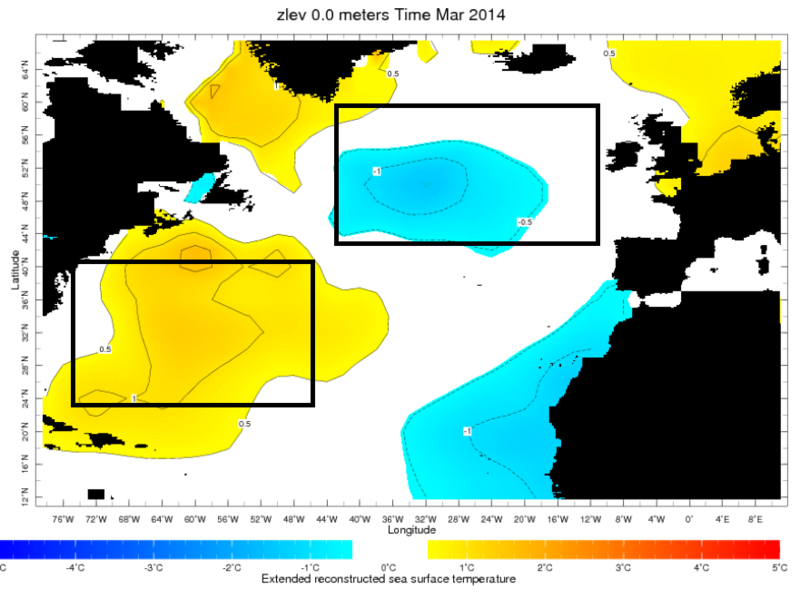 Essentially SSTs were wrong for us on both sides this winter- Pacific and N Atlantic. I hope to see a May tripole this year. February 2009 was interesting because we had a spectacular SSW event just before that month but the northerly blocking at least on our side of the globe was not spectacular. You compare that to the following two winters when we had more robust northerly blocking before any SSW events had occur, although with 2010-11, it weakened after the New Year. I don't think there was a SSW event during 2010-11 anyway. One thing I thought of. In the future, if that cold pool over the North Atlantic becomes more common place, gets colder, bigger etc could it lead to more snow from Polar Maritime air than we currently see due to less modification as it crosses the Atlantic? Depending on how potent a polar maritime blast is depends on how much snow I get from one. When it's potent I do quite well, when it's run of the mill it's a coin flip but usually great above 100m to 150m while I have patchy or a slight covering at 40m Asl. Often even a half of a degree makes a huge difference in these set ups. February 2009 is when I saw my deepest snow whilst I was in Northampton... there must have been around 30cm as we were just on the right side of marginal when the snow events popped up earlier on in the month and milder air was trying to push through from the south. I do remember the GFS ensembles mid month very well. All except 1 went for persist cold from T96 to T384 with the mean around -10C. The exception was one rogue member in the ensembles which turned out to be right and in 24 hours the entire ensemble suite flipped. Along with the failed easterly in January 2005 at T48 that has to be the most remarkable switch. I think NW England will do better when it comes to cold zonal periods as the colder uppers that fall in the cold blob region are modified less by the SSTs. Although 2014/15 wasn't particularly snowy, it was a colder winter then expected given the synoptic pattern and that is when the cold blob was at its deepest. It was also deep during December 2015 but the winds for that month were from the SSW meaning the cold blob had little influence on things. Yeah I wonder long it would to take to have an appreciable difference in the amount of snow from it. I was reading about it earlier today, as I thought they believe it's from the extra melt taking place in Greenland, more freshwater, less salt content so the cold water doesn't sink to the bottom like it used to. Based on that, one would think it will only get worse, the extreme case being a shut down of the gulf stream to the upper North Atlantic. Will be fascinating to see what happens. What's your thoughts? 1) What Happened and Why Did It Happen? - this is 95% of the time and it's quite boring because you have all the information and it's not terribly difficult to ascertain a pattern or sequence of events. 2) What Should Have Happened and Why Did It Not? - this is the really interesting 5% and clients trying to work out what went wrong rarely start from here. It's amazing how often people expect something to happen and are completely flummoxed when it doesn't. A confirmatory mindset takes over and they repeat the same event, get the same result and start wondering what has gone wrong. Anyone seeking to analyse Winter 2018-19 for the UK should start with the second question. Nick F's blog this morning is a superb analysis of the first part of the first question though as with all of us enthusiastic amateurs the "why" requires more information than to which we have access. It's disconcerting to see organisations such as ECM and UKMO with access to far larger information resources and infinitely more sophisticated and detailed computer modelling still get it wrong but at the same time mildly encouraging for those who like to think there are mysteries still to be solved. 1) Where has all the Fog Gone? - whether caused by AGW or not, the thought I had this morning was another winter has gone by with barely any morning fog. If I were in the physics game, I'd be wondering whether a warmer world creates more energy in the atmosphere making for a more mobile atmospheric environment. More energy in the atmosphere might mean a stronger PV with all that flows (so to speak) from that. I'd love to know what the PV looked like in the mediaeval warm period or during the late 17th Century. Did it exist? Is it where it is now? Did it behave as it does now? It is such a crucial part of the pattern especially as it draws intensely cold air down into North America and encourages cyclogenesis and fires up the Atlantic jet. 2) When is an SSW not an SSW? - it's now clear the SSW of January 2019 was a very different creature from the SSW of February 2018. The latter was akin to the flushing of a toilet with hot water - this swept down the atmosphere shredding the PV and allowing the cold air to flow down (and more importantly the warmer air to flow up), Within less than 3 weeks from the actual vortex split, we were looking at a significant cold outbreak. We were told then (and indeed at the New Year) not all SSWs work favourably for NW Europe and this one obviously hasn't. I'm less convinced what we saw wasn't an actual SSW but a very strong Wave 1 displacement. These, as we know, usually come from the Eurasian side and shunt the PV lobe back to the Canadian side. They rarely do us any favours apart from as a cumulative effect weakening and destabilising the PV. We rarely get a warming from the Canadian side (I believe the 62-63 cold spell originated with a Canadian Warming) and it's worth asking why these don't happen. Even now there's no sign of another Wave 1 and while the PV is weakening as we head to month end the comparison with 2018 is incredible. Oddly enough, the best recent comparison is with 2013 - yes, I know. Curiously, we are now seeing some quite warm water off the eastern seaboard of CONUS so I wonder if that explains why the Atlantic LP are slowing and deepening? It's one to keep an eye on and an indicator worth revisiting for further analysis. 4) It's the Sun, Stupid - a final thought occurred when doing some reading and I picked up a comment that the winter immediately prior to a solar minimum is often mild in north west Europe. No explanation as to why this should be and I'm not convinced the analysis tells a good story as the Modern Maximum was a huge event but we still got some very cold winters (I'm still wondering if that was related to sulphur dioxide emissions). Clearly, the Maunder and Dalton Minimums were significant periods for colder winters but the 11-year cycle is relevant. Looking at winter 2008-09 there were two significant cold spells but overall it was fairly mild. IF this is valid, it may be the proponents of a cold winter were simply a year too early with both 2019-20 and 2020-21 looking much better. That said, will this minimum be as strong as the 2009-10 Minimum? It will need to be to deliver the cold and snow many on here want. As the song says, there are "more questions than answers" and I don't have a lot of the latter. I appreciate the angst of the young bears but there's no need to rail against forecasters, climatologists or each other. If you want to understand the weather better, start learning about it. NW has plenty of information as a starting point. Yes I have heard the cold blob may be due to the increase in freshwater from Greenland as well. The early 2010s were so mild in that region so maybe this caused the extra supply of freshwater? Maybe there was a lag effect and it only began to appear in 2013. I think the problem with predicting how it will develop in the future is that we have quite a poor understanding about what is going on deeper in the oceans. We don't have much data to go on as the RAPID array for example was only set up in 2004. The really pronounced slowdown in 2010 got a lot of attention but we haven't seen much like it since. How big that colb blob will get is another interesting question. It was very impressive in August 2015 and has shrunk a bit but persisted since then. If the cold blob gets so big maybe snowy NW winds will be a common thing? 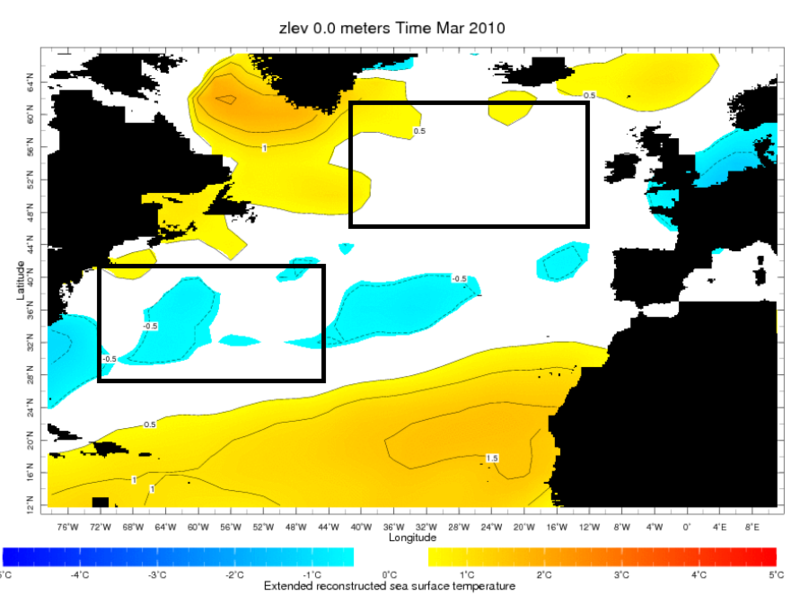 Then there is the question of how the AMO and PDO influences things, so a lot of questions to be answered. This is an interesting question that I think may also be relevant. I'm not too clued up on this but I remember reading that since the late 1980s Europe has turned sunnier and there has been a drop in the amount of fog also. There has been a cut down on certain emissions since the Montreal protocol so perhaps a change in the composition of the air perhaps had an impact on the SLP patterns? Looking at winter 2008-09 there were two significant cold spells but overall it was fairly mild. No, winter 2008-09 could not be described as a mild one by any means. It had an overall CET of 3.53; both December and January of that winter were below average, and the first half of February was cold, it was only the second half of February of that winter that was mild. Winter 2008-09 did come out as a reasonably cold one overall although it wasn't especially so.